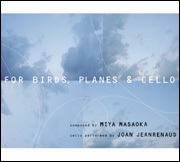 A continuous field recording with cello. For Three choirs and nine soloists spatialized in balconies. Boy sopranos, male falsettos and operatic singers join forces in a total of three choirs and nine solosits consisting of one humdred and twenty singers. 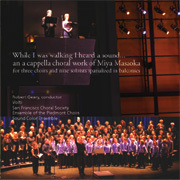 While I Was Walking, I Heard a Sound is scored for up to 42 voices and explores the boundaries of vocal art. It was recorded in a large, resonant cathedral with a natural 2.5 second reverberation.